Today’s post is written by Colin Bloom, the Executive Director of the Conservative Christian Fellowship (CCF), recently returned from the Conservative Party Conference in Manchester. You can follow both Colin and the CCF on Twitter. The Conservative Party conference in Manchester was a great place to be. There was a sense that not only does the party know where it is going but it is also confident and proud of its achievements thus far. The exhibition hall was filled with live music from Elvis impersonators to brass orchestras (though fortunately not together) and the buzz from members attending the speeches was positively electric! Throughout the exhibition hall were all manner of stalls; not least of which was a stand dedicated to the late Baroness Thatcher. ‘MaggieShop’, as it was called, contained T-shirts, brollies and mugs that were adorned with famous quotes such as “I am in politics because of the fight between good and evil”. Apart from that the CCF stand was obviously the place to be! We went ‘all in’ this year, with what was probably the largest stand of any of the exhibitors, and with a mission to make a bold impact (72sqM over two levels) many people remarked that this wasn’t just a CCF stand, but it was in fact a Christian city. This atmosphere provided a great platform for our supporters. Part of the mission of the CCF is to bridge the gap between the Christian world and the Conservative Party and it was clear from our stand, that this is what we intended to do. The team worked alongside eight fantastic Christian charities; Christian Aid, Compassion, Cafod, Tearfund, International Justice Mission, Haiti Hospital Appeal, World Vision, and Hope For Justice, each with their own stand and staff inside our ‘city’, each empowered to network amongst the delegates. Our raised lounge and meeting tables ensured that high-profile guests and MP’s stopped by and spoke to the partners and some great connections were made between the two. Whilst political leaders past and present dropped in, I was particularly struck by an older lady who stopped by to speak to one of my team, she commented that she ‘hated religions’ and had only stopped by the stand as it was too large to miss! Conversations between the two surged from religious wars through to the oppression of women, and though the intention was to be provocative our guest was by struck the accommodation of our team. From initially seeing the CCF as ‘out to convert’ she commented that our work was refreshing and promised to stop by the next day after some thinking. Early on the Tuesday (two days later) she returned, this time with a smile and hug, our team were able to introduce her to the work of our eight partners and gave us the chance to be salt and light. I think it is fair to say her heart was softened. In the mornings, time was set aside for prayer breakfasts where supporters and MP’s mingled over their tea and cornflakes. This relaxed and informal atmosphere was where you could share your table and voice with those who make the decisions and join brothers and sisters in prayer. Our partners came along with us and presented their work, directing the scores of early risers on how they can support and pray for the work they do. 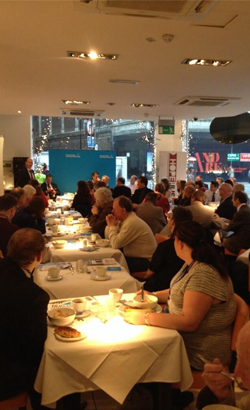 We didn’t just have breakfast with guests we inspired them and equipped them too! The highlight of the week for many was when nearly 1000 people descended on !Audacious church for the Party Conference Church Service. A celebration of our faith and a representation of the work Christians are doing in Manchester. We wanted to show that the church was alive and thriving, relevant and making an impact. Lively worship with rock guitars, classic hymns, gospel choirs and cabinet members, our service was the face of the living church in Manchester. Along with Pastor Komolafe of Jubilee church Manchester (RCCG) Major Alan Watters of the Salvation Army led us in prayer with Rob white and the Bishop of Bolton speaking from the heart about the needs for Christians to engage in political life. The highlight for me was Chip Kendall; I never expected to follow a rapper with a mohican at a Tory conference event and I know a few of the congregation are still in shock. But when you see members of parliament lifting their hands in prayer and worship, party members dancing, tears flowing for the disadvantaged you cannot help but think that lives where being changed. Manchester is a great city and God is doing amazing things, it was a privilege for us to be able to showcase just a small part of this. In his final speech David Cameron remarked that Britain is to be a land of opportunity, that ‘the land of hope is Tory’. Coming away from the conference it is clear that this land of opportunity and hope includes a church that is alive and relevant, and that in the Conservative Party there is a well respected and loved voice, there is a ‘CCF city’ on a hill. ‹ Since when did the Church of England decide to curl up in the corner and wait to die? ‘Tears flowing for the disadvantaged’ at a so-called Conservative Christian gathering – is it possible to be Christian and a Tory?? – then the message needs to get to those sinister ministers who are creating still more disadvantage by their attempts at money saving from the most vulnerable …… Makes me sick to think about it: ‘tears flowing for the disadvantaged’ – were there crocodiles there too? I think it is very unfair to assume that all Conservatives are that hard hearted. There are a range of views and beliefs within the Conservative party just as there are in Labour. If the CCF is showing a compassion should that be encouraged or does that mean they should leave the party? 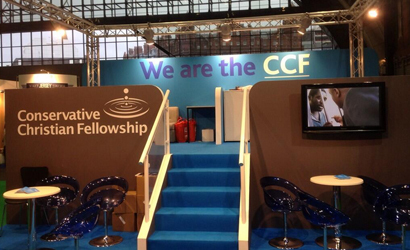 A really good insight into the work of CCF at this year’s Conservative Party Conference. Very pleasing in particular to see the emphasis on building links between senior Conservative politicians and the wide and varied church community. My heartfelt congratulations to Colin and his team at CCF and I hope that they are managing to find some post-Conference rest and relaxation. As the Chair of the Lib Dem Christian Forum, I would encourage anyone of Christian faith and who is an active member or supporter of the Conservative Party to join CCF and become involved in their work. They provide a strong and consistent witness for the place of the voice of faith in the public square and of the positive impact made by local churches and Christian organisations throughout the UK and across the world…. This was certainly a very heartfelt and passionate post. It makes me realise that many people in politics are my brothers and sisters in Christ, and I therefore have an automatically strong connection to the political world through the Body. I am praying earnestly for our government, and I will be praying very hard that those tears shed in a worship service lead to a deep, Christ centred transformation of policy towards the most vulnerable, whatever that looks like. Thank you Colin, for sharing your passion with us. I am thrilled that the CCF is making such an impact on the conference, well done Colin and team. Perhaps you can explain to Cameron that Hope is not a Tory possession and for many people it is Tory policies that have extinguished hope from their communities. Reading about the work of Christians at the liberal and conservative party conferences has been encouraging with a clear willingness to be more visible. Is there similar work going on with Christians in the labour party and has it been as prominent ? I’m waiting for the Christian Socialist Movement to finish an article for me on their conference experiences. Hoping the wait won’t last too long. Would be good to hear from them too. It is good that the author recognises that there needs to be a bridge between christianity and Conservatism. Though it must be a very large and sturdy bridge in order to cross what is not a small gap, but an ever-widening chasm. I frequently wonder how those in the party who profess a christian faith reconcile their serving two masters. On the one hand, you have a christian faith with a commandment to love others as yourself. On the other, you are subscribing to a party which demonises the poor, unemployed, ill and disabled. Micah 2:1-2 is a very apt description of the current government. At what point does the christian faith kick and make a member of the Conservative realise that they are signed up to is perpetrating evil? I’m all for light shining in dark places, and there can be fewer dark places than the hearts of those around the cabinet table who plot and scheme against the margianlised, whose detachment from reality has rendered them heartless to the plight of the millions who are forced deeper into poverty as a result of the capitalist ideology which the Conservative party supports.